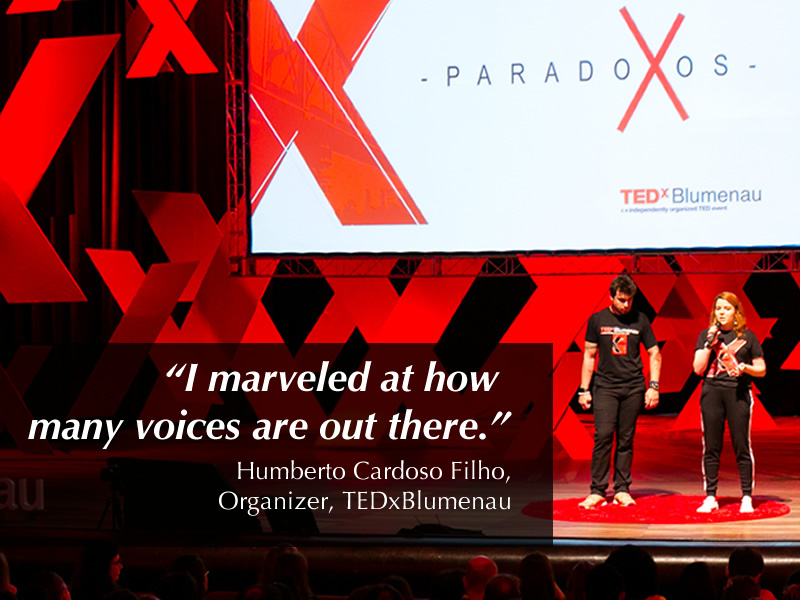 Humberto Cardoso Filho is the organizer for TEDxBlumenau, located in the southern part of Brazil, near the coast. He and his team have produced 11 main events and 7 Salons, all under 100 people. He recently attended TEDfest, so the population limit was removed for the event held in March 2018 which had 300 attendees. They're going to take it slow as they expand, especially into a new venue. Blumenau is a city of 400,000, with a vibrant TEDx community that has been developed strategically to keep everyone engaged by using Salons to focus on relevant themes. "We find the conversations our city needs to have." This explains what Humberto believes makes their event compelling. Blumenau is a center for fashion in Brazil, and they've seen how fashion can be used as a tool for social transformation. They addressed several topics, including Intimacy, which sounds like it was fascinating for a Salon to focus on. Humberto says that their coaching process takes six months and is a significant difference between TEDx and other local events. Their speakers are very prepared and the entire six months is broken down into a detailed timeline. About his hack, he suggests that a workshop is held for sponsors to bring them into the event and show how they might help make an impact. Note: I've not heard this before, we're going to replicate. Humberto when to TEDGlobal in Rio and his TEDx journey began. He organized events in college in Sao Paulo. Humberto got the guidelines wrong for his first event and ended up being denied a license. Since then, he talked with Ambassadors and had an interview with TED in NYC, and since then, everything’s been great. 11 main events and 7 Salons. He focuses on Salons that have specific regional interest, like Fashion and Intimacy. Attendee cap at 100 with over 600 that want to attend. They stream live to over 5-10 thousand to help fill the desire for the talks. For Salons, consider you are signing up for 3 events. Look at the big picture of why you’re doing them. Keep a strong connection to the City. 300 people (now that he’s attended TEDfest) and a new venue. Host a workshop for sponsors, to show them how they can contribute beyond in-kind or financially.